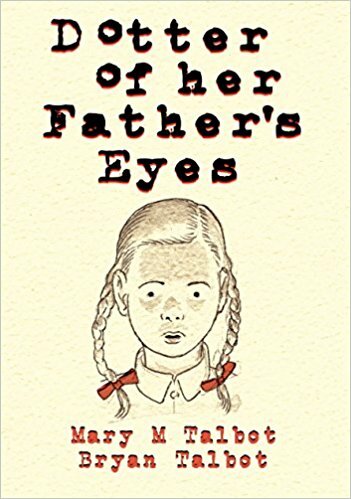 Dotter of her Father’s Eyes is the semi-autobiographical story of Mary Talbot (illustrated by her husband Bryan Talbot), told alongside the fascinating story of Lucia, the daughter of the famous author, James Joyce. The two daughters’ early childhood could not have been more different. For Mary, it was a matter of tip-toeing around her father’s tantrums and strict hand, while Lucia was encouraged to be open, creative and was bathed in affection. The girls grow up into women and the roles slowly reverse. As Mary continues with her education, her father appears to become proud of her but as Lucia follows her dream of becoming a dancer, her family dismisses that aspiration as worthless and improper for a young lady. Her ambitions are soon quashed and the venomous blame she holds towards her parents results in her own brother having her committed. These two tales work well alongside each other and the story of Lucia is especially engrossing. It was a shame that no actual positive aspects of Mary’s life were included as it did become a very sombre read. From her childhood to childbirth, it continues to focus on the negative. What really makes this book are the illustrations, from the simplicity of the cover to the perfectly captured emotions on the characters faces. These images bring the story to life in a very beautiful and unique way.